Safety first: will life rafts really save your life? This weekend has left us wondering about the steps we take to ensure we are boating safely and maximizing our ability to survive should the boat go down. It’s a bit morbid, I know, but I will explain what happened. We had access to two life rafts which were out of date. The perfect opportunity to test out how they work without spending hundreds of dollars on a survival course (which, by the way, I think would be worth it for anyone keen to make ocean crossings). The first was a Canadian made 4 person raft. Smaller, more compact, much lighter and easier to lift than the larger 8 man raft. We gathered around the pool to watch the men pull at the rope that should ordinarily release the pin on the gas bottle and then inflate the raft. Well, first of all, although there is about a meter of rope hanging out, it needed to be pulled about 10 meters before it even got to the pin. After the anticipation of the first pull of the line fell away, we just became more and more concerned by the fact that once we had pulled all we could, nothing happened. This then required us to dismantle the entire raft. It turns out that the rope became tangled when it was re-packed during a service. No matter how hard we tried, we would never have been able to pull the pin without dismantling the raft. Quite concerning don’t you think? Other than that, the raft seemed reasonably well equipped. It also took a lot of effort to flip over!! We thought we would then have more luck with the French made 8 person raft. How wrong we were. We pulled and pulled on that rope until we could pull no more. Broke the case open to try and work out what we were doing wrong. We did nothing wrong. The pin on the gas bottle was not even existent. Whether it got pulled out and didn’t work or was just never there, we will never know. Needless to say, after pulling the whole raft apart, it never got inflated. It did, however have plenty of food (if you want to call it that) and water, as well as some playing cards… Just in case you got bored out there. Kind of pointless when your raft and it’s contents are likely to end up on the bottom of the ocean. Another thing we noticed is that all attachments which had been glued on were no longer connected. The glue had failed. Whoops. Although the life rafts were out of date, the problems they had were not influenced by time at all (except maybe the glue thing, which is minor in the scheme of things). So I guess the answer is, make sure you have your life raft serviced at a reputable service provider. In the end though, how do you know their reputation is based on fact? If the one line ensuring your safety can easily get tangled, how do you check their work once they’ve done it? It’s not like you can double check it when you receive the raft back, until the day any little mistake they’ve made could be fatal. Do a survival course, great. But the life raft needs to work in the first place!! What do you do to maximize your safety whilst at sea?? Yes right you are. 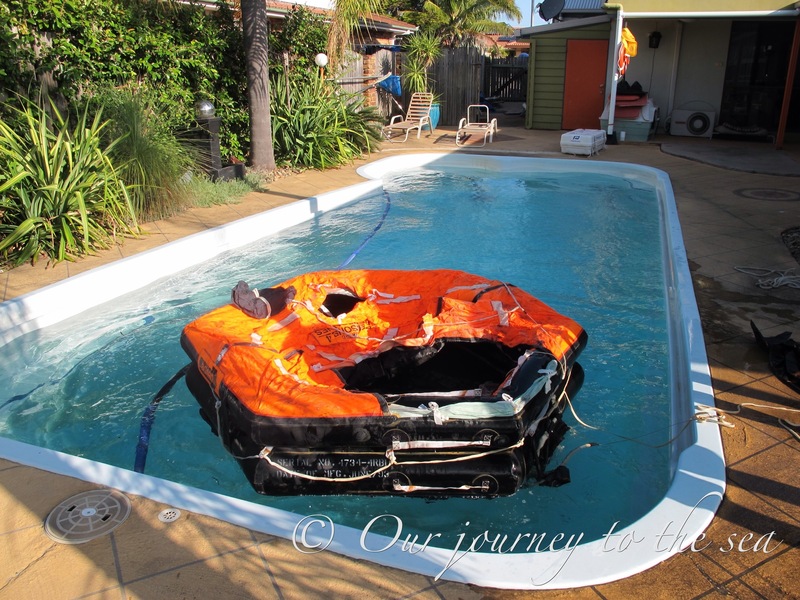 My mum found a dinghy-liferaft which can sail/motor/paddle. 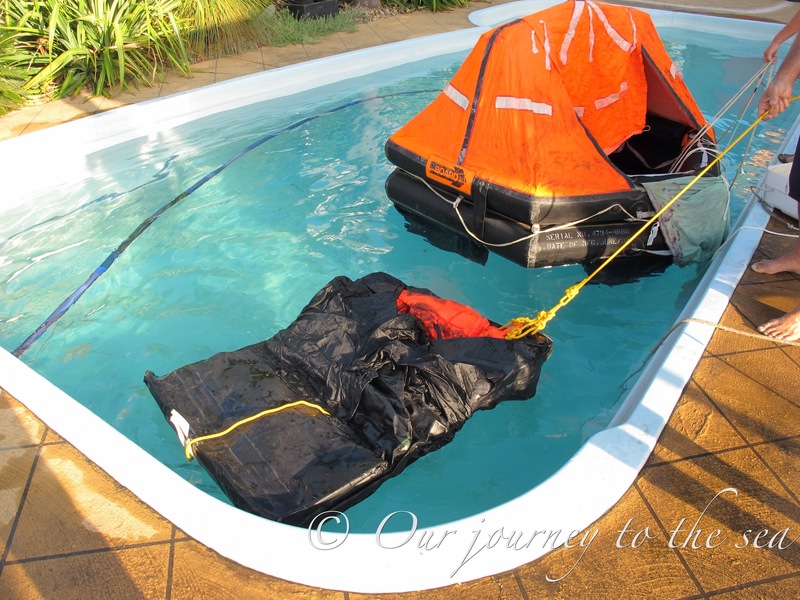 I’m just left wondering whether its possible to keep the “liferaft necessities” in an everyday use dinghy… If it came down to it, I’d still take my chances on having a liferaft and just hope that it works if really needed. It was a fun and insightful exercise anyway! Thanks for sharing that link. I will check it out. When I did the sea survival course at Clipper we went through the whole liferaft deployment activity, and you are correct. the liferaft needs to run the full length of the line (some 10 m) before it eventually does Autoinflate. That yours didn’t in either case would be devastating to discover in an abandon ship situation. That you did this in a pool and found out that there were many issues, some safety and fit for purpose related and some, discoveries that were really useful to learn before deploying in anger was great. We went through everything that is fitted (including the ‘food’, which were like high fat shortbread, and that is all, water (not much at all), and cards (interesting to note that one of the single greatest determinants of survival at sea was the ability to keep your mind focussed on survival and running a routine). Even after doing the full course, when the time came for our first abandon ship drill, which was in the middle of the night. many people came on deck in their undies, no one had had anything to drink and no one thought to collect food as they went through the boat. We learned that once you are in those flimsy little things all you have are your mates and what you bring with you, so take time to gather your thoughts and the things that prolong life and increase your chance of getting found. the golden rule at sea. Look after your boat, your crew, then you. and that starts with knowing everything you can about your boat (even the liferaft). Well done you for finding all this out, and even better for sharing it. Next fun game to play is Man overboard drills….. The clipper training sounds so good. It would definitely be useful for those of us intending to go on sea journeys. It’s interesting that no one thought to grab food or drink during the drill. I imagine the mind would be even more forgetful in a real emergency. I guess that’s why people prepare grab bags. Great reminder to test your life raft. We took ours to a shop and had it refitted professionally, and even though we were standing in a factory, I was nervous when we pulled the line. It worked and we spent some time inside it to get ourselves familiar with it. Also scary, and something I hope never to do as sea. I’m glad yours worked. It’s great that you got to test it out. I now believe that anyone owning a liferaft should test one out at some point and see how they really work. if you stick to the catamaran idea, it gets even harder to sink them! an upside down cat, makes a great life raft, not that I ever want to test that theory…. the hard, positively buoyant sailing dinghy, with a shade covering would be my second choice. Keeping emergency supplies in a mini olive barrel or similar near the raft or lashed to it while at sea can save you time too. You are so right about catamarans. We’re unlikely to change our kinds about that. Great ideas thank you. Hopefully we, and none of you, ever have to try out this advice for real! Happy and safe sailing to all of you!